It’s a good question with a very simple answer. 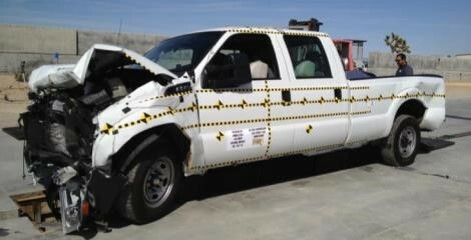 You may hear many different opinions about crash testing, depending on who you ask in the CNG industry. But there’s just one definitive answer – Federal Motor Vehicle Safety Standard Title 49 Part 571.303; Fuel system integrity of compressed natural gas vehicles. It’s only three pages long and easy to understand. The FMVSS Standard says that any CNG vehicle (dedicated or bi-fuel) weighing under 10,000 lbs. GVWR – the F-150, F-250, F-350, or Transit, for example – is required to undergo physical crash testing of a representative vehicle. That’s right – physical crash testing. There’s no allowance for an engineering “white paper” or a judgment call from the engineering group. Federal law requires the safety of the CNG system to be demonstrated. Is Crash-Testing Cheap? No. Is it necessary and required? Yes. Do we do it? Yes! Landi Renzo USA ensures that we are in full compliance with FMVSS 571.303 because, as stated in the regulation, the purpose of the test “is to reduce deaths and injuries occurring from fires that result from fuel leakage during and after motor vehicle crashes.” Protecting the lives of drivers and passengers is critically important for us. We complete three individual tests – frontal barrier crash, rear moving barrier crash, and lateral moving barrier crash. That’s right, we take a perfectly good Ford truck equipped with our CNG system and crash it to ensure compliance with the National Highway Transportation Safety Administration (NHTSA) and Department of Transportation (DOT) requirements. What Does Crash Testing Actually Achieve? The layman’s explanation is that the test measures the drop-in fuel system pressure over a 60-minute period. If the pressure exceeds a certain threshold, there was a CNG leak, which could lead to catastrophic results in the case of a fire. If the fuel pressure drop is under the threshold, the CNG system complies with FMVSS 571.303. This isn’t an area we play around with. Nor should you. Whether you are responsible for selling CNG vehicles to end users or you’re the fleet manager specifying trucks, there is too much liability, and potentially lives, at stake to not buy CNG vehicles that are compliant with Federal law. With so much inaccurate information in the market, we believe it’s our duty to ensure that customers understand what Federal law requires. If you are purchasing a CNG product under 10,000 GVWR, ask the CNG vehicle manufacturer to provide a written declaration they have complied with FMVSS-303, to include the location of the test, date of the test, and the outcome. Anything less, and you may be dealing with a non-compliant vehicle. Landi USA is preparing to complete our physical crash test this coming month. The date is locked in and we’ll be sharing more as the time approaches. We are also gearing up to ensure our MY2018 5.0L will be fully FMVSS-303 compliant as well. We’ll tell you more on that at a later date. https://www.landiusa.com/wp-content/uploads/2017/04/landirenzo.png 0 0 admin https://www.landiusa.com/wp-content/uploads/2017/04/landirenzo.png admin2017-05-31 17:14:522017-05-31 17:41:40Is Crash-Testing Required for CNG Vehicles?